Breakfast for dinner. What more needs to be said? For some, that is more than enough justification to whip up this easy and satisfying oven omelette, eating it for breakfast, lunch, or dinner. 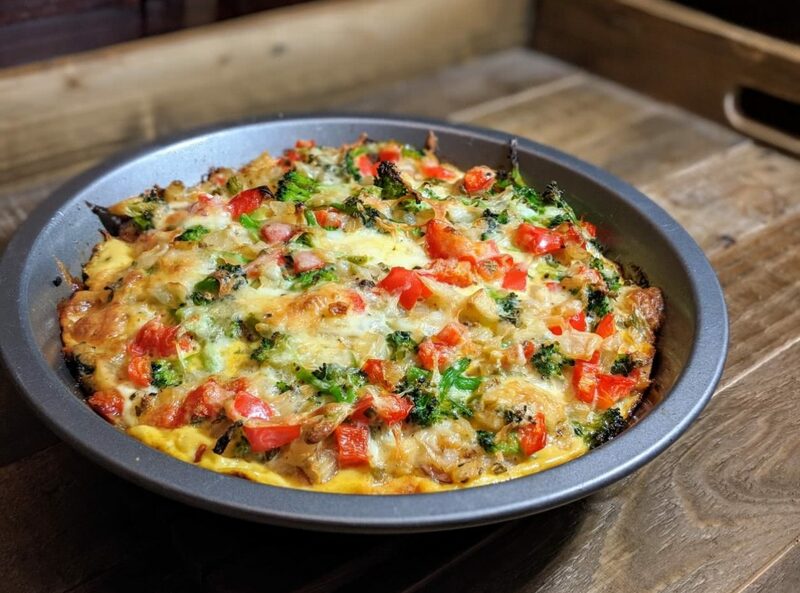 The medley of freshly steamed and sauteed vegetables that are slightly underdone before bakings ensures a contrast of textures, and no soggy vegetables, when the omelette completes its bake time. The colorful array of vegetables that are slightly bound together by the eggs and nestled on top of a thick sweet potato crust balances out the entire meal. Additional peppers, such as jalapeno pepper (1/4 cup) or sun-dried tomatoes (1/4 cup) work great. Just make sure to not add too many ingredients or else the egg proportion becomes too low. Prepare the vegetables for the oven omelette. Dice the onion and peppers and mince the garlic, keeping the vegetables in separate piles. In a saute pan, over medium heat, add the olive oil and heat until shimmering. Add the onions and saute for about 5 minutes, or until translucent, stirring occasionally. Next, add the garlic and saute for about one minute, until aromatic. Add the peppers (I used the optional jalapeno pepper) and lightly saute for 2-3 minutes. Remove to a bowl to stop further cooking and to cool. While working on step #1, place a stockpot fitted with a steamer basket and lid filled with 2 inches of water over high heat and bring to a boil. Place the broccoli in the basket and steam for 2-3 minutes, until vibrant green taking care not to overcook the broccoli. Remove to a bowl to stop further cooking and to cool. Step #1 and #2 can be prepared ahead of time and placed in the refrigerator until you are ready to assemble the oven omelette. Grease a cake pan or pie plate and layer the sweet potato slices in the bottom of the dish. Whisk the eggs together in a bowl and season with salt and pepper, along with the cayenne and paprika. Add in the cooked vegetables and the grated cheese, as well as any optional ingredients such as the sun-dried tomatoes. Pour the mixture into the greased plate over the sweet potatoes and top with the reserved cheese. Bake for 35-40 minutes, until the egg dish is puffed and the broccoli begins to get charred in places. Let cool slightly once removed from the oven, slice, and serve! Optional toppings include sriracha, sour cream, salsa, or any hot sauce.